A report from outside investigators this week detailing former students' complaints of sexual misconduct against two Central Connecticut State University professors — and the university's failure to take corrective action — highlights a blind spot in Connecticut's Freedom of Information law. Specifically, the state allows its labor agreements to include language that supersedes its own Freedom of Information Act. As a result, the allegations detailed in the report did not see the light of day for years, nor were they held up to the public scrutiny that comes with such disclosures. Despite the allegations against the two theater department professors — Joshua Perlstein and Thomas Delventhal — the dysfunction was simply allowed to fester in direct conflict with the spirit of the disclosure requirements included in the state's FOI law. Based on this week's report, however, CCSU President Zulma R. Toro is now seeking to fire both Perlstein and Delventhal. Perlstein was reportedly placed on paid administrative leave in April and Delventhal was placed on paid leave last week. The report, compiled by the Hartford law firm Shipman & Goodwin at CCSU's request and released this week, includes several recommendations for the university to consider. But the Board of Regents, which oversees the State University System that includes CCSU, should add one more to the list: stop agreeing to the FOI exemption for employee personnel files during labor contract negotiations. In fact, let's go one step further: The Connecticut General Assembly should protect the public's right to know by ridding us all together of the law that allows labor contracts to include language superseding state law. 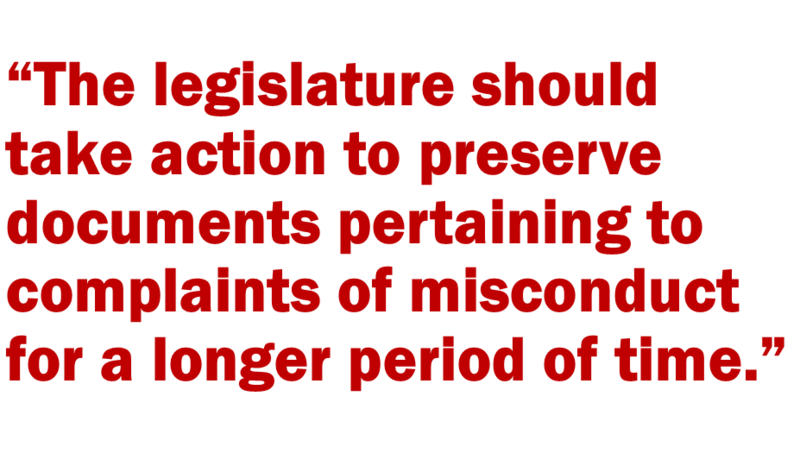 Furthermore, the legislature should also amend laws to require improved retention of documents pertaining to complaints of misconduct against state employees. The state's Freedom of Information Act makes public employee personnel files available to the public, and for good reason. These files contain documents that not only outline allegations of misconduct, but they also detail the manner in which supervisors respond. Shipman & Goodwin's investigation found evidence that the two CCSU professors likely engaged in sexual misconduct toward students for years but faced essentially no punishment. In some cases, administrators even failed to interview complainants and key witnesses. CCSU's decision to hire Shipman & Goodwin for an investigation came only after The Recorder, CCSU's student newspaper, detailed in April 2018 allegations from former students against Perlstein. Subsequent reporting by the Hartford Courant uncovered additional incidents, but the union contract exemption for State University System employees has prevented members of the news media from reviewing Perlstein's personnel files. CCSU has released Shipman & Goodwin's final report, but the public has a right to view this information itself and shouldn't rely on an investigation for such access. The state's FOI law was put into place in 1975 to ensure residents have access to such information. This right shouldn't be bartered away during contract negotiations between public agencies and employee unions. Additionally, the legislature should take action to preserve documents pertaining to complaints of misconduct for a longer period of time. When CCSU President Zuma Toro decided to investigate a 2005 complaint against Perlstein, she needed to obtain a copy of the report from one of the reporters at The Recorder. To Toro's credit, she ordered departments that handle harassment complaints to stop shredding documents after reports about Perlstein surfaced. The state should follow suit and do the same for all public agencies. Shipman & Goodwin found it likely that Perlstein's inappropriate conduct dates back to at least the late 1990's, when he is alleged to have tried to kiss a former student. The "Me Too" Movement has demonstrated time and again that predators in a position of power will engage in an ongoing pattern of sexual harassment, misconduct or even assault against those under their authority. It's time for Connecticut to stop enabling this behavior by providing avenues for secrecy and the destruction of important documents. Mike Savino is president of the Connecticut Council on Freedom of Information and serves on the Board of the Connecticut Foundation for Open Government. This commentary first appeared in CTNewsJunkie.